APRIL 16 -18, 2015 – Advance tickets $10 per event, $12 at the door, or $25 for 3 events. $100 Sponsor level includes all events and a special gift! The Musical Ecologies series continues April 16th thru 18th with a three-part festival of Acoustic Ecology co-curated by composers Andrea Williams and Dan Joseph. Coined by the Canadian composer and theorist R. Murray Schafer in the 1970s, the term acoustic ecology refers to the study of the effects of the acoustic environment on those creatures living within it. An outgrowth of the World Soundscape Project conducted by Simon Fraser University in Vancouver, BC in the late 1960s and early 70s, acoustic ecology has grown through the ensuing decades into an academic and artistic discipline, capturing the interest of composers, sound artists, and scientists throughout the world. 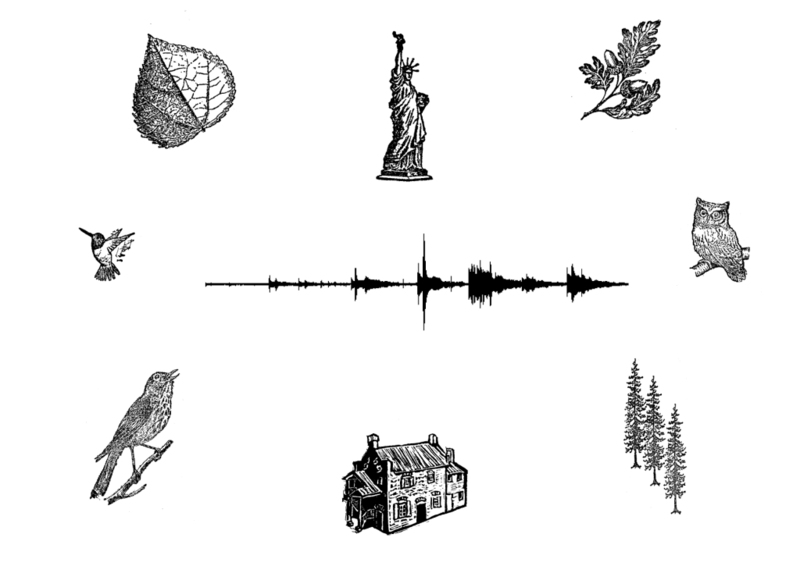 Taking place over three days, the Brooklyn Acoustic Ecology Festival offers an opportunity to explore our understanding of sound in our environment through the work of a group of selected artists who will present performances, talks, and soundwalks in and around the Old Stone House in Park Slope. Composer Michelle Nagai creates music, sound art and performances for people, places and things. She has been doing this on her own and in collaboration with other artists – in music, dance, video and theater – since the late 1990s. In tandem with her work as a composer, Nagai's published writing reflects a deep engagement with the intersection of words, sounds, places and ideas. In 2011, Nagai lived in rural Japan, the recipient of a creative artist fellowship from the Japan-United States Friendship Commission. She now resides in rural New York State, where she continues to explore connections between sound and place. Nagai’s work has been presented in North America, Japan and Europe with the support of institutions including the American Composers Forum, Deep Listening Institute, Harvestworks, Eyebeam, the Interdisciplinary Laboratory for Art, Nature and Dance, the Jerome Foundation, the McKnight Foundation, Meet the Composer, the National Endowment for the Arts, and the New York State Council on the Arts. Stephan Moore is a composer, improviser, audio artist, sound designer, teacher, and curator based in Brooklyn and Providence. His creative work currently manifests as electronic studio compositions, solo and group improvisations, sound installation works, scores for collaborative performance pieces, and sound designs for unusual circumstances. Evidence, his long-standing project with Scott Smallwood, has performed widely and released several recordings over the past decade. He also performs with the improvisation quartets Bumpr and Volume(n), and is a frequent collaborator with the performance groups The Nerve Tank and a canary torsi. He is currently President of the American Society for Acoustic Ecology, and the curator and artistic director of In The Garden of Sonic Delights at the Caramoor Center for Music and the Arts, a recurring 5-month exhibition of outdoor sound art across Westchester County started in 2014. He will complete his Ph.D. in Electronic Music and Multimedia the MEME program at Brown University in May 2015. Dan Joseph is a freelance composer, performer and curator based in New York City. Active in a wide range of musical contexts, Dan performs regularly with his chamber ensemble, The Dan Joseph Ensemble as well as composing works for a variety of ensembles and soloists including Gamelan Son of Lion, the SF Sound Group, baritone Thomas Buckner, the Mannigan-Tunick duo and others. Since the late 1990s, the hammer dulcimer has been the primary vehicle for his music and he is active in a variety of collaborations with sound artist Andrea Williams, glass instrumentalist Miguel Frasconi, cellist Loren Dempster and saxophonist John Ingle. Dan has held residencies at Headlands Center for the Arts, the Lower Manhattan Cultural Council and currently is Artist-In-Residence at Harvestworks Digital Media Arts Center. Also active as curator and presenter, he currently produces the monthly music and sound series Musical Ecologies at The Old Stone House in Park Slope, Brooklyn. Sound artist and composer, Andrea Williams, utilizes site-specific elements and perceptual cues to reveal the unseen connections between people and their environment. Her compositions make use of field recordings, instruments, computer technologies and the sound of the performance space itself. She has led soundwalks in New York and the Bay Area, and has shown and performed both solo and with various musicians at galleries and alternative spaces internationally, such as the Whitney Museum, Headlands Center for the Arts, Children’s Creativity Museum, NPR, Miami Art Fair, and the Mamori sound artist residency in the Amazon rainforest. Andrea is a founding member of the New York Society for Acoustic Ecology, a board member for the American Society for Acoustic Ecology, and she is attending Rensselaer Polytechnic Institute for her Ph.D. in Electronic Arts. Viv Corringham is a British vocalist, composer and sound artist living in New York. She is a 2012 and 2006 McKnight Composer Fellow through American Composers Forum and is certified to teach Deep Listening by composer Pauline Oliveros. Recent work has been presented in ICA, London; Greece; Hong Kong; Australia; Tempo Reale, Italy; and Her Noise, Tate Modern, London, UK. She is a 2015 Artist in Residence at Harvestworks, NY. Recent recordings include solos “Walking” (Innova), “Gum + Butts” (Linear Obsessional), and “The Pattern Familiar” by Monkey Puzzle Trio (Slowfoot). Articles about her work have appeared in many publications, including In the Field (UK), Art of Immersive Soundscapes (Canada), Organised Sound (UK), Musicworks (Canada), Playing With Words (UK) and For Those Who Have Ears (Ireland). Johann Diedrick & Christie Leece are artists based in New York City. Johann makes sound installations, experimental performances, and audio software. Christie’s work merges her interests in archaeology, fieldwork, animal studies and new technologies, and frequently involves sound. Moira Williams creates participatory works that bring people together and make explicit the complexity of their community and the environment. She is a founding member of the walking cooperative Walk Exchange, a Laundromat Project Fellow, has spoken at Elastic City Walks Festival, Dorsky Curatorial Programs, Open Engagement Conference for Art and Social Practice and been interviewed by C Magazine in Canada. Her work has been seen in Adrienne Outlaw’s FLEX IT! MY Body. My Temple., Jennifer Monson’s iLAND, Thomas Hirschhorn's Gramsci House, Walk 21 Munich, Issue Project Room NY, No Longer Empty's This Side of Paradise NY, DUMBO Arts Festival, The Kitchen, MoMA PS1 and the Ghetto Biennial Haiti. Moira is currently an artist in residence at 601 Tully House in Syracuse, NY, and will be an artist in residence at The Luminary Residency this summer and contribute to FLOAT in St. Louis, Mo. Comments closed — Trackbacks closed RSS 2.0 feed for these comments This entry (permalink) was posted on Thursday, April 16, 2015, at 6:08 am by Dan Joseph. Filed in press release.